St. MARTINS BREWERY A leasehold property - offered for sale 1794. Accused 10.07.1866 of being open out of hours. Building dates back to 1558. The White Lion Brewery is recorded from 1830 to early 1840s, run by James Butcher. Known by the 1930s as DANCOCKS, after the then long serving landlord. (The adjoining property was destroyed and rebuilt as a single storey building. This was used as a hairdressers salon. Later this building was incorporated into the WHITE LION). 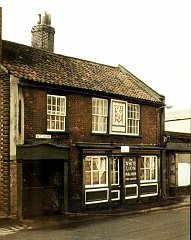 A freehouse from 1975 and offering a wide range of ales from 1982. Refurbished in 1980's including removing the ground floor cellar to a building in the yard and converting the old cellar into a third bar. Following a change of owners in 1988, the house passed to Brent Walker and by 1990 was trading under the name of TAP & SPILE from 30th May 1990. Returned as the OLD WHITE LION 16th July 1997. Closed January 1998 and re-opened February 1998 after `a lick of paint'. under the ownership of the Cambridge Milton Brewery. Two rooms - Bar and lounge. Original brick fireplace on first floor.